A number of changes to the text of the requirements for this merit badge were first published in the Soil and Water Conservation merit badge pamphlet (#33291A) issued in 2004. The revised requirements were also included in the version of the pamphlet issued in 2008 (#35952) and in the 2010 revision of the 2004 edition (#35952 - SKU 610016) and each printing of each of those editions. However, the revised text was not included the 2005 edition of Boy Scout Requirements, nor in any of the subsequent editions of that booklet, up to and including the 2019 edition of Scouts BSA Requirements which have all included the older wording of the requirements. What is shown below is the text from the merit badge pamphlets, NOT the text in the Scouts BSA Requirements book. To see the differences between the text as it has appeared in Boy Scout Requirements/Scouts BSA Requirements, and the text which has been used in the merit badge pamphlets.\, Click here. In addition to the changes mentioned above, a new requirement 4e was added in 2017 but omitted from the 2018 edition of Boy Scout Requirements. That change has been included in the 2019 edition of Scouts BSA Requirements and is included below. Tell what soil is. Tell how it is formed. Describe three kinds of soil. Tell how they are different. Name the three main plant nutrients in fertile soil. Tell how they can be put back when used up. Tell why soil conservation is important. Tell how it affects you. Name three kinds of soil erosion. Describe each. Take pictures of or draw two kinds of soil erosion. Tell what is meant by "conservation practices". Describe the effect of three kinds of erosion-control practices. Take pictures of or draw three kinds of erosion-control practices. Explain what a watershed is. Outline the smallest watershed that you can find on a contour map. Outline, as far as the map will allow, the next larger watershed which also has the smaller one in it. Explain what a river basin is. Tell why all people living in a river basin should be concerned about land and water use in the basin. Explain what an aquifer is and why it can be important to communities. Make a drawing to show the hydrologic cycle. Demonstrate at least two of the following actions of water in relation to the soil: percolation, capillary action, precipitation, evaporation, transpiration. Explain how removal of vegetation will affect the way water runs off a watershed. Tell how uses of forest, range, and farmland affect usable water supply. Explain how industrial use affects water supply. Tell what is meant by "water pollution". Describe common sources of water pollution and explain the effects of each. Tell what is meant by "primary water treatment," "secondary waste treatment," and "biochemical oxygen demand." Make a drawing showing the principles of complete waste treatment. Make a trip to two of the following places. 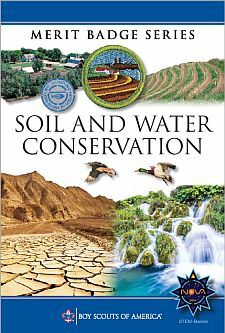 Write a report of more than 500 words about the soil and water and energy conservation practices you saw. A managed forest or a woodlot, range, or pasture. A wildlife refuge or a fish or game management area. A conservation-managed farm or ranch. A public drinking water treatment plant. Plant 100 trees, bushes and/or vines for a good purpose. Seed an area of at least one-fifth acre for some worthwhile conservation purposes, using suitable grasses or legumes alone or in a mixture. Study a soil survey report. Describe the things in it. Using tracing paper and pen, trace over any of the soil maps, and outline an area with three or more different kinds of soil. List each kind of soil by full name and map symbol. Make a list of places in your neighborhood, camps, school ground, or park having erosion, sedimentation, or pollution problems. Describe how these could be corrected through individual or group action. Carry out any other soil and water conservation project approved by your merit badge counselor.